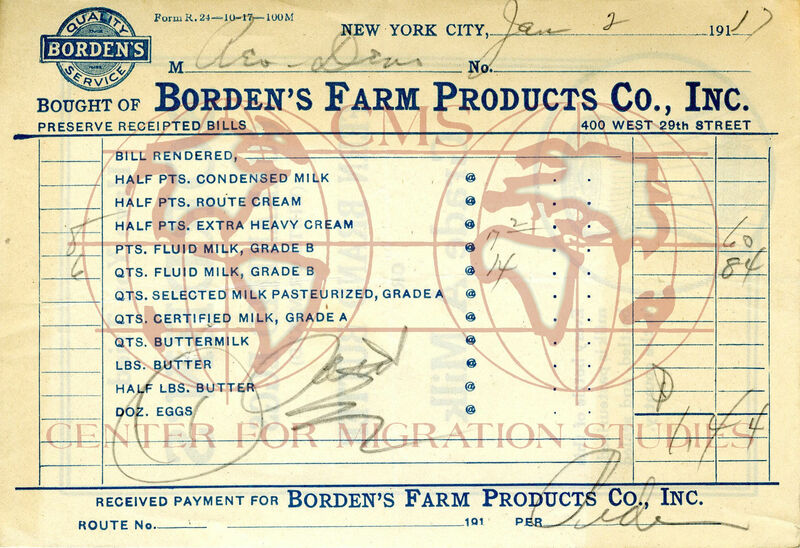 A receipt from Borden’s Farm Products Co., Inc. obtained from the Center for Migration Studies. This website focuses on the quest for the American Dream throughout World War I in a very unique way. By examining different documents, such as receipts and ledgers from old stores and businesses, this website takes a look at how various goods and services affected the life, liberty, and pursuit of happiness of so many different members of society. This particular website, which was constructed around documents that were obtained from the Pompeii Papers at the Center for Migration studies, was created in hopes of ultimately preserving historical buildings around New York City. While some immigrants purchased items like beverages, which affected liberty due to the fact that the taxation of the war supported the ongoing war effort, others purchased food such as milk and pastries that happened to have an impact on their everyday lives. For instance, pictured left is a receipt from Borden’s Farm Products Company, Inc., a very popular company in the milk and dairy business. While food, such as the food purchased from Borden’s Farm Products Company, Inc. affected people directly, it also managed to help many others around them due to the fact that they food industry offered many jobs. Fruit businesses, beverage businesses, and bakeries are just a few of the many companies that affected the life, liberty, and pursuit of happiness of the immigrants around them. This entry was posted in Center for Migration Studies (NY), Exhibits and tagged American Dream, Businesses, Our Lady of Pompeii. Bookmark the permalink.